Ride/pace group leaders should lead by example and encourage a "culture" of safety. 1. Be familiar with the route before starting, if there are any potential safety issues (e.g., bad pavement, blind turns, etc.) on the route, do a short ride briefing at the start. 2. Keep the size of the paceline manageable. If you have more than 6 or 8 riders, consider breaking the group up into multiple smaller groups at the ride start. Discourage larger groups from regrouping at stops. 3. In the event of an accident, the ride leader(s) should consult Vero Cycling, Inc.'s Accident Instructions. 4. 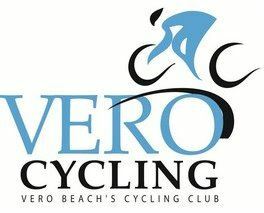 Bicycle helmets are required on all Vero Cycling Club rides. DO NOT use the verbal signal "CLEAR" as everyone must make their own judgement as to the safety of any intersection or occasion where this term might be used. This is best practice and is the recommendation of the League of American Bicyclists. 2. Follow the "Rule of 2s"
If you are pulling, point out obstacle 20 ft in front of you as a right or left obstacle depending on how you plan to circumvent it. Note that if you are leading a large group, by the time the last rider is notified of the danger, he/she may be next to the obstacle considering the delay in messaging down the line. Don't over-do the pointing. It loses its value. Crying wolf too often renders your followers less attentive to your efforts. Point out any obstacle that is 2 ft to the right or left of you. Stay at least 2 feet off the rear wheel in front of you. Obviously, less space is more efficient but should be reserved for very small groups (less than 4) with lots of experience. 3. If the pace is beyond your capabilities, rotate to the back quickly and stay out of the rotation. 4. It is important that you relay all messages started by the group leader ASAP to give all riders time to react and adjust regardless if you see the obstacle yourself. The tendency is to see the obstacle before alerting everyone. 5. Pay close attention to the rider in front of you and respect the 2 foot guideline (as in the rules of 2s above). 6. Be aware of who is behind you as well your surroundings and attempt to frequently look past the riders in front of you to anticipate any danger including a traffic light that is about to change. 7. It is important that you be as steady and predictable as you can for the safety of all riders. Frequent and sporadic use of your brakes for no apparent reason (to the rider behind you) and frequent interruption in your pedal stroke makes you an unsafe rider. Better spacing between the rider in front of you and "soft" pedaling helps to reassure the rider behind you and prevents you from on/off braking. 10. Pacelines are meant to share the work load, so limit your pulls to a few minutes to stay fresh and give others a chance to pull.